The very best writing reads like music. It has rhythm. It has style. 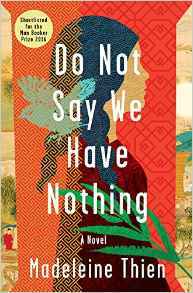 Madeline Thien’s Do Not Say We Have Nothing is a symphony. 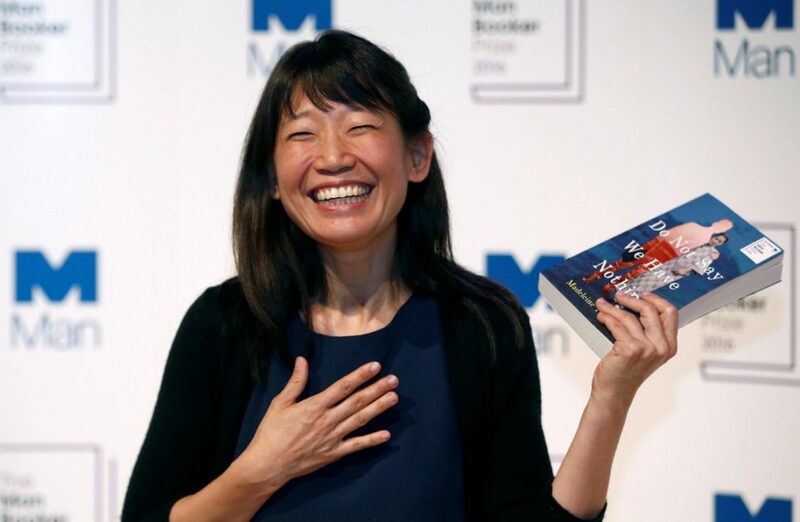 The author weaves a tale of her native China, the tragic and tumultuous history with the stories of interlaced characters pulled through generations. We see history not only as it unfolds, but in the impact, it has on its people. The book is an extraordinary achievement winning the Scotiabank Giller Prize and being short-listed for the Man Booker Prize of 2016. While the competition for both prizes was intense, Do Not Say We Have Nothing is a standout. Thien‘s style is intricate and beautiful. She is deft at moving through settings, characters and time. It is a book that can be described, as Annie Lamont put it, written ‘word by word.‘ From the very start, I found myself inwardly gasping at the beauty of her writing. The book opens with a profound and engaging beginning. “In a single year, my father left us twice. The first time, to end his marriage, and the second, when he took his own life.” Page 3. From this start, we follow Thien’s journey to understand the events that led to this pass. She is living in Vancouver, in an apartment shared with her mother when we first encounter this thoughtful, cerebral girl. Before long a third person arrives without a coat and carrying a light suitcase. She is a family friend whose history is connected to theirs. What links them together is the fact that both of the fathers were musicians forbidden to practice their craft in the dark years of the Cultural Revolution. If music sustained her father, Marie finds a home in mathematics. “In the spring of 2000, after my mother passed away, I gave myself entirely to my studies. The logic of mathematics-its methods of induction and deduction, its power to describe abstract shapes that have no counterpart in the real world- sustained me. I moved out of the apartment that my mother had been renting ever since she and Ba first came to Canada, and in which I had grown up. Desperate to leave it behind, I cobbled together every penny I had and bought a dilapidated apartment on Alexander Street. The windows looked straight out into the port of Vancouver and, at night, the endless arrivals and departures of multi-coloured shipping containers, what they held, what they divulged, comforted me. This picture finds an easy grace in my imagination. The link between Shanghai and the western ports of North America, where we now receive goods too staggering in size to even contemplate from a nation that was once brought to its knees is both beautiful and sad. That is the tone of the work; it hit the right note for winter reading. Every once in a great while, we pick up a book that deserves to be read twice. Some sentences are so profound that the reader needs to stop and puzzle through them. Sometimes it means putting the book down and returning to awaiting tasks with the thoughts presented rattling around begging for more time. Ideally, a great novel gives us a new understanding, either of times and events or, in the best possible scenario, of the pages of our own story. Madeline Thien’s work carries the power to do this. Could it be possible that I feel as if I am a better person for having read Do Not Say We Have Nothing? I hope so. For God knows, there is much work to be done. This entry was posted in fiction and tagged British Colombia, China, Cultural Revolution, Fiction, Giller Prize, history, Man Booker Prize, Shortlisted, Vancouver on February 25, 2017 by Elizabeth Smythe Brinton.